It costs about $1,000 per day to keep a ship at the port. From the top of Singapore's Equinox bar you can see the city skyline and ship after ship after ship. Singapore claims to be the busiest port in the world, with some 130,000 ship arrivals each year. But these days, the problem is many of those vessels are not putting back out to sea. The usual stay for a cargo carrier is just ten days. That is enough time to offload one set of cargo and take on another load, re-fuel and re-stock supplies. But, of the 220 container ships arriving in Singapore this year, - excluding the tugs, yachts and bunkering vessels which are permanent port residents - more than half have stayed longer than that. Another 44 cargo ships have been in port for more than six months. It costs about $1,000 (£614) per day to keep a ship at Singapore port. On top of that, most of these ships would have been bought with multi-million dollar loans that need to be serviced. They will have a crew that needs to be paid, fed and watered. Engines and machinery that need to be maintained. All of this is necessary for a ship to maintain its class - the equivalent of an MOT or bill of health. Being taken "out of class" means a ship cannot trade or earn money and cannot be insured for voyage on the open sea. The sharp downturn in world trade is behind this enforced idleness. And, in the absence of global economic recovery, all firms can do is minimise their costs. A ship owner can save up to 80% of his or her running costs just by laying anchor 45 minutes south of Singapore, off the Indonesia islands of Batam-Rempang-Galang. 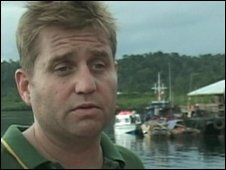 Earlier this year, Rob Wilkins, general manager, Enviro Force, opened a new anchorage off Galang. "In Singapore you have to maintain a full crew (25-30 people on average) on-board your vessel," he says. "You can save on insurance costs, maintenance costs and crew costs by laying up here instead." Mr Wilkins and his partner Damian Chapman are serial entrepreneurs. 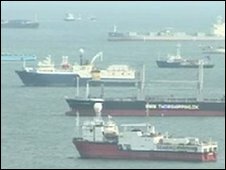 Many ships are stored outside Singapore for cost reasons. For months, they have noticed more and more vessels idling in ports, running up huge costs. According to AXS Alphaliner, 511 container ships are laid up. That is a tenth of the global fleet. "Laying up" is the term for taking a ship out of service. There are different levels: hot stacking requires the engines to be fired up every day, allowing a vessel to be brought back into service in days; but a vessel kept in cold stack can be welded closed with engines off for months at a time. At the most extreme end, ship owners can take the ship out of class and save hundreds of thousands of dollars in insurance costs alone. But, these are drastic measures. Ship owners have a range of options before they lay-up their vessels. The most common is idling your vessel beyond the port perimeters. On the ferry between Batam and Singapore, Damian points out ships that have been left anchored for months. They don't pay port dues which saves them money but also means they don't have access to port services. One Singaporean shipmaster (who wants to remain unnamed) brags business is booming since he turned his two small service ships over to water supplies. Crew on these idling vessels are not allowed to go ashore for food or water. A rusting oil tanker also sits outside Singapore limits. Damian says it is being used for storage. "When the oil price was low, it was worth buying up crude and holding onto it until the price rose," he says. as soon as scrap metal prices recover." And that's a big problem. Even for those owners who want to cut their losses and sell up, the market is grim. Jonathan Le Feuvre, managing director of shipping services firm Fearnleys Asia, says "scrap metal prices are down 75% from their peak a year ago". "And," he adds, "there are no trading buyers" who would buy the ship as a going concern. Only those who have to sell, perhaps forced by their bank, would sell up at such low prices. Mr Le Feuvre recites anecdotes of Chinese and Greek shipping owners who have snapped up bargains at a 90% discount from the peak. There is, however, some sign of hope on the horizon: China. "It's the only game in town," according to Mr Le Feuvre. "It is single-handedly lifting the dry sector (trade in coal, metal ores and other raw materials) out of recession," he says. "Ten months ago, owners of Capesize bulk carriers (ships carrying 150,000-170,000 dead weight tonnage used for the transport of, say, iron ore and coal) were effectively transporting cargo for free at charter rates of $5,000 a day." On 8 July, rates hit $67,000 a day. But, many question whether this recovery in the dry sector can be sustained. 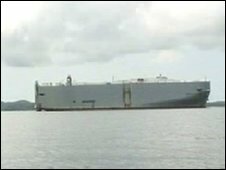 Owners of smaller container ships used to transport consumer goods such as cars, televisions and refrigerators say business remains slow. There is still little sign people in the United States and Europe are returning to shops to buy these shipped goods. And dismal US jobs data suggests economic recovery will take longer than hoped. AXS Alphaliner predicts a quarter of the container fleet will be idle by the end of next year. "Things will look pretty rosy in containers about 18 months from now' time," says Mr Le Feuvre, "but we're going to go through a year and a half of hell to get there." Where is the BBC Box?